As soon as I saw the bookshelf stamp for this month's Studio Calico kit, I knew these pictures were perfect. I've had lots of fun working with this kit. I really love the tree paper, especially the little hearts carved in them. In the little pocket, there's some hidden journaling. I love that both these layouts came from the same kit + add-ons. So versatile. 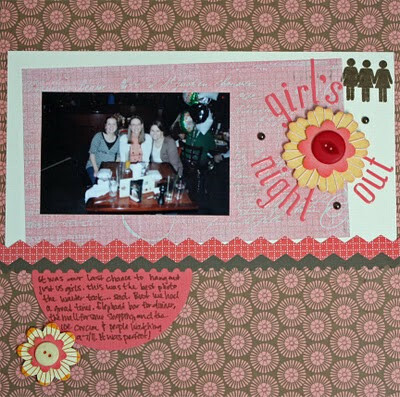 This one is about our last girl's night out. The blurry picture actually isn't that bad. I've spent a lot of time inside lately, as the high this week was somewhere around 26 degrees. Which means, lots of scrapping and watching movies. We've been building lego towers and reading lots of stories. I've got plans tonight to go into town tonight. By town, I mean Idaho Falls, which is about 25 miles away. I've got some major errands to run, including lots of grocery shopping. I'm hoping to try out some new recipes. Also, yesterday was my first post up at the Polka Dot Whimsy Blog. You can check it out here! How cool was it to see a stamp that was your idea in a SC kit! 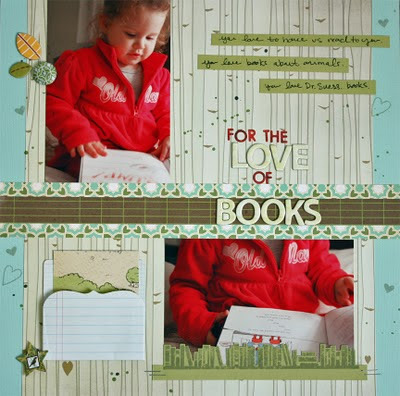 adorable pages - i esp love the books one! Love these--love the girl icons all lined up! Oh, I love these. The red photos in the first LO look so good against the green and white SC paper. So cute! SOO cute! Love your layouts! Have fun in 'town'...lol! I love the "for the love of books" layout! That color combo is delicious and I love how you used the new stamp, too!